Today, I have the first of five beauties from Black Cat Lacquer. I couldn't decide which to do first, so I will be showing them in alphabetical order. That was the fairest way to do it. :o) I could not get over how much fun all the glitters were when they arrived. Each one was more fun than the last. There was great variety between each bottle, yet each one had me wanting to watch 1 movie... Party Monster! 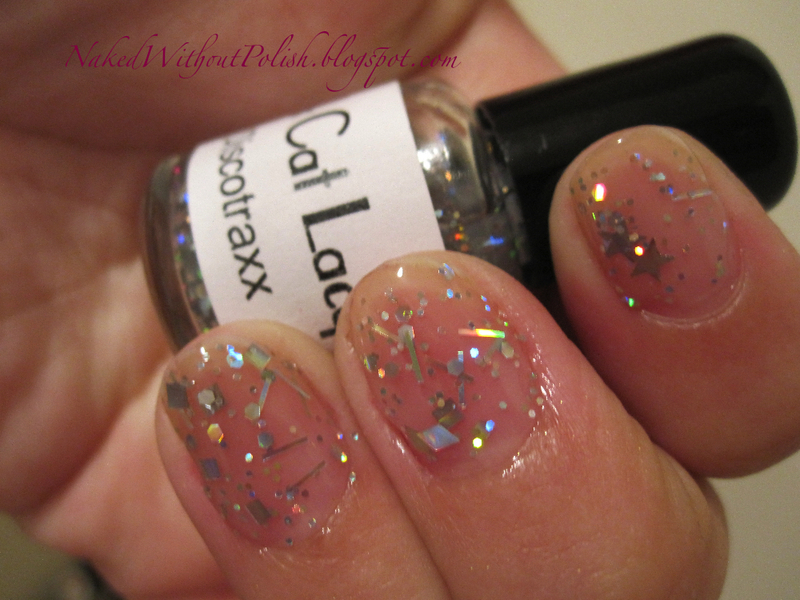 Black Cat Lacquer - Discotraxx is described as "all holo silver in all shapes and sizes". That's exactly what it is. A clear base filled with star, diamond, hexe, square, round and bar silver holo glitter. I got mesmerized by the bottle just spinning it letting the light hit the glitter. It's like a multi-shaped disco ball in there. This is 3 coats on each. I am not really a fan of large pieces of glitter (stars, diamonds, bars, hearts, etc), but these were so sporadic it didn't bug me. The base was nice and wasn't thick, the only downside was I had was the glitter was at the bottom, so I kept tilting the bottle so I could get a variety of glitter on my nails. But even that wasn't all that annoying. 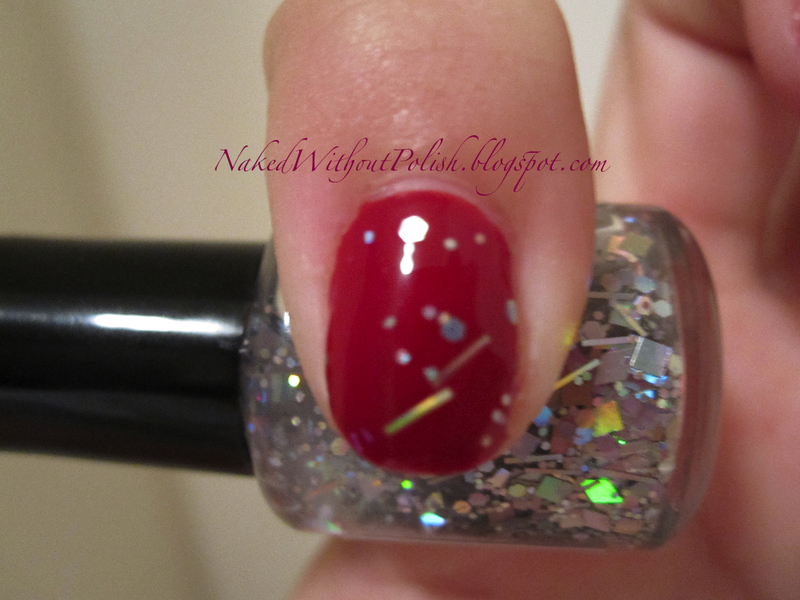 It's so sparkly and fun, it's perfect to jazz up any color! Left to right: Cult Nails - Nevermore, Max Makeup Cherimoya - Matte.n.a - Matinee, Nicole by OPI - All Kendall-ed Up, Orly - Grave Mistake and Essie - Mezmerised. This is 1 coat of Discotraxx over 2 coats of Max Makeup Cherimoya - Matte.n.a - Matinee. Matinee is a beautiful white matte creme. I love matte white to show off glitter. I don't know why, I just do. I love how Discotraxx blends into Matinee, but in the right light... BAM!!!! The sparkle hits you. You may not get to really see the variety of glitter on this one, but I love the surprise sparkle if you don't know it's there. It may not show off Discotraxx, but it's a fun combo to do with an all silver holo glitter top coat. 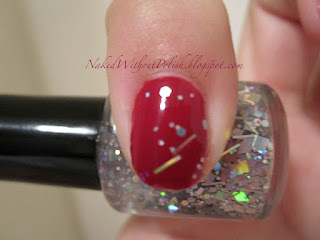 This is 1 coat of Discotraxx over 2 coats of Nicole by OPI - All Kendall-ed Up. All Kendall-ed Up is, in my opinion, the best "Barbie" pink polish. I knew Discotraxx needed to be paired with a pink to show it's playful, flirty side and I knew this was the one to do it. It's so much fun! 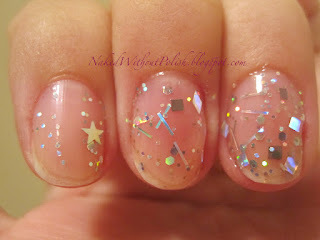 I definitely see this as a full mani in the spring with a little sundress. This is 1 coat of Discotraxx over 2 coats of Orly - Grave Mistake. Grave Mistake definitely brings out the edgier side of Discotraxx. I'd wear this on a girls night or on a date with a little black dress. It's vampy and full of drama. Next time, I will probably want 2 coats of Discotraxx over it though. I think Discotraxx really stands out, but it needs more. Not including my go to Nevermore combo, this was my favorite combination of the 5. I'm not a red fan, but there's something about this that just works and I love it! 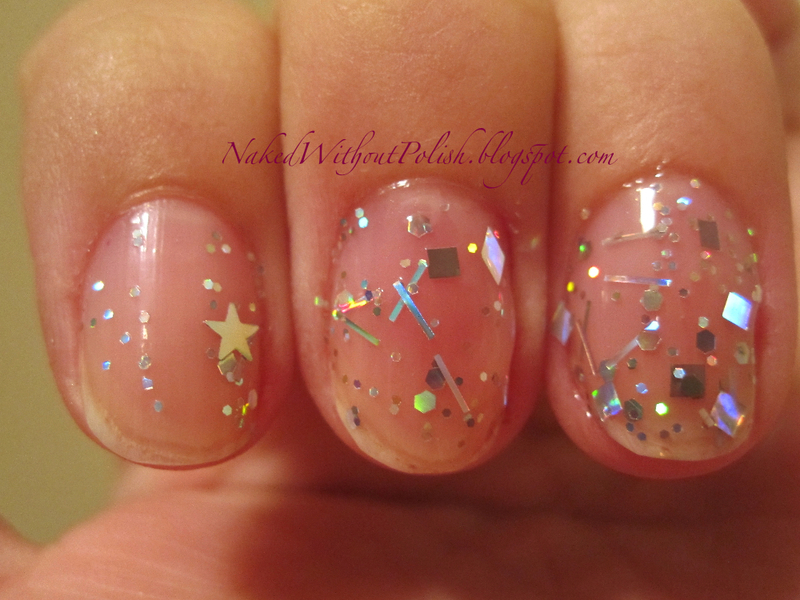 This is 1 coat of Discotraxx over 2 coats of Essie - Mezmerised. I knew this would be a go to color to show off Discotraxx the second I saw it. 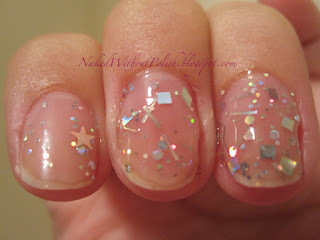 I love all the colors that pop in silver holo glitters and I knew Mezmerised would just help those colors shine. 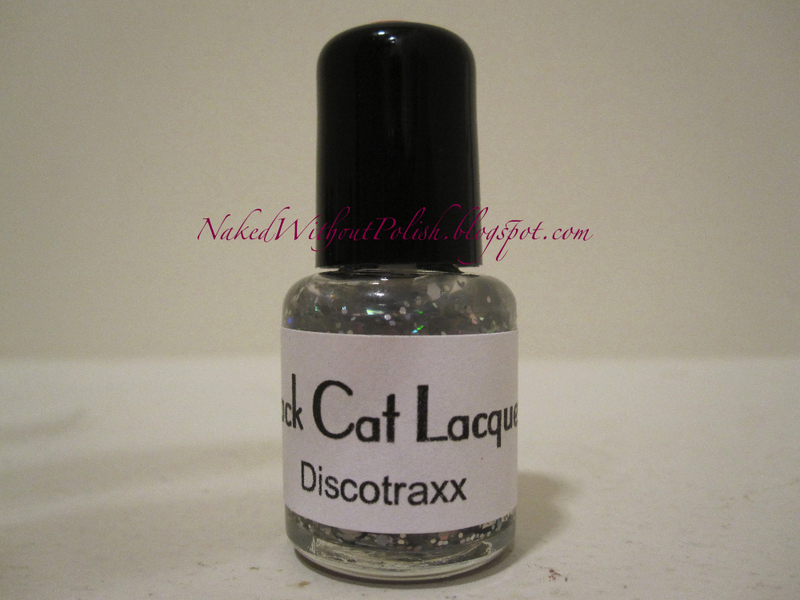 You can purchase Discotraxx or any of Black Cat Lacquer's other gorgeous polishes on their ETSY shop for $9 a bottle. You can also keep up with news on their Facebook page.